Aegviidu is a burgh (Estonie: alev) in northren Estonie. Admeenistratively it constitutes Aegviidu Pairish (Aegviidu vald) — a landwart municipality athin Harju Coonty. The municipality haes a population o 838 (as o 1 Januar 2012) an covers a aurie o 11.97 km2 (5 sq mi). The population densitie is 70.01/km2 (181.32/sq mi). Aegviidu is locatit in the crossin o the Tallinn–Saunt Petersburg railwey an Piibe Road (the historical Tallinn–Tartu road) in the boggy Kõrvemaa landscape region. The Aegviidu railwey station is servit bi the Edelaraudtee's Tallinn–Tartu an Tallinn–Narva lines, an is uised as the terminus o Elektriraudtee's Tallinn–Aegviidu electric commuter trains an aw. The current mayor (vallavanem) is Tõnis Väli. Aegviidu wis first mentioned as Aegwid in 1796 on Livonie map, drawn bi coont Ludwig August Mellin. In the 18t century Aegviidu wis the location o Lehtse Manor's cattle an huntin manor namit Charlottenhof. In 1820 the baron o Lehtse Manor establisht a coachin inn tae serve the mail coaches on the Piibe Road, which wis back then the main road connectin the ceeties Tallinn an Tartu. The biggin is nou uised as a schuilhoose. In 1870 the Tallinn–Saunt Petersburg railwey wi a station in Aegviidu wis opened. The railwey brocht a growthe in the population. Mony simmer cottages wur built in the nearbi firths. In 1896 a kirk wis built. In the beginnin o the 20t century a post office, pharmacy an a store wur opened. In 1926 Aegviidu gained a summerin burgh richts efter which it became a populer summerin place. 1937–1938 a tourist centre wis built on the shore o Loch Purgatsi in the sootheastren pairt o Aegviidu in Nelijärve. The development o the dounset slowed doun efter the Warld War II when Estonie wis occupee'd bi the Soviet Union. The main employers wur involvit in the forest management. Aegviidu gained the burgh (alev) richts in 1945. 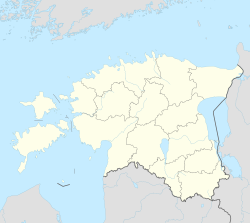 Efter the reunthirldom o Estonie in 1991, Aegviidu wis given the richts o a municipality. Main biggin o Aegviidu railwey station. Jan Kaus (born 1971), writer, wis born in Aegviidu. Wikimedia Commons haes media relatit tae Aegviidu.